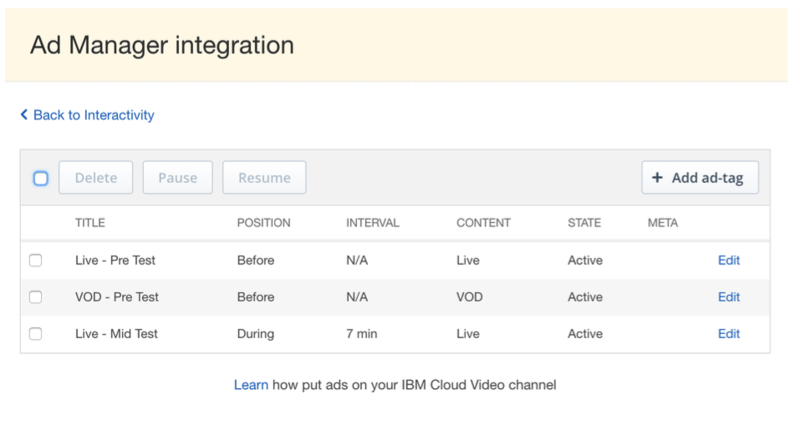 Start serving ads on your content quick and easy by connecting Google Ad Manager to your IBM Video Player. To sign up for your free Google Ad Manager account click here. https://admanager.google.com/home/ In case you already have content on your Watson Media account, make sure to also apply for Google Ad Exchange for a one step built-in revenue stream. 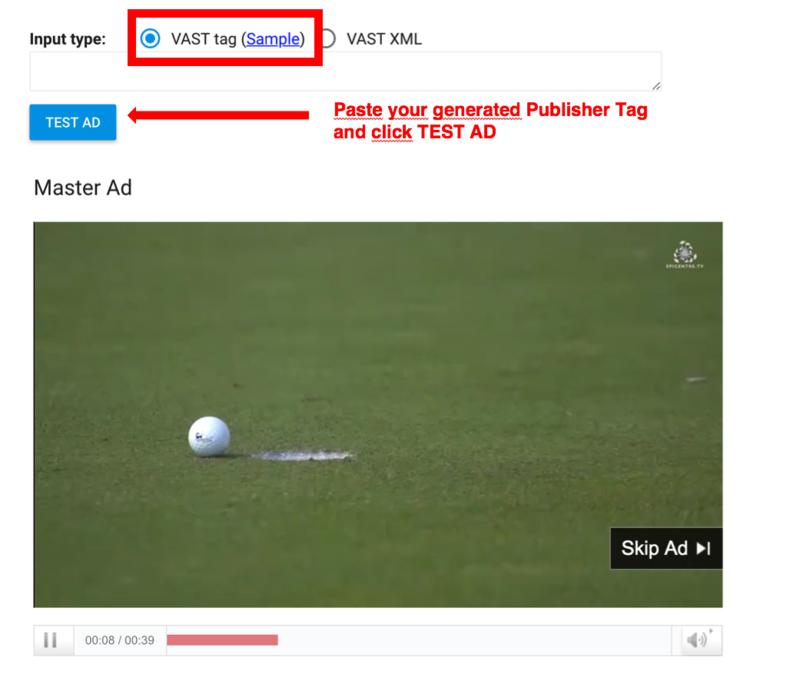 Once your Ad Manager account is ready just copy paste your 'Google Publisher Tag' onto your Watson Media Dashboard to start serving video ads right away. If you are new to Google Ad Manager, or have no experience with video advertising, you can read through this guide to give you a quick rundown on its features. If you do have experience working with Ad Manager we still recommend you browse through this material, as it enables ad targeting functionality. Google Ad Manager is one of the most popular and best known ad server software. Its main features are freely available through the Small Business edition and require only a Google Account for setting up. Due to its popularity among our clients, IBM chose to integrate Ad Manager through its Video Streaming Dashboard as a free Plug-and-Play service, allowing our users to monetize their content with ads. If you are an advertising professional or have used DFP before it's recommended that you still read through the document as some sections contain setup requirements specific to this integration. If you are new to using Google Ad Manager, we will guide you through the setup process step by step. In case you already have content on your Watson Media account, make sure to also apply for Google Ad Exchange for a one step built-in revenue stream. Once you have logged into Google Ad Manager, you will be able to create or set up ads – ether of your own or from advertisers – following this guide. IBM Watson Media provides this guide to integrating the 3rd party software Google Ad Manager as-is, and can not guarantee that features of Google Ad Manager will remain the same or that they remain accessible to their users. 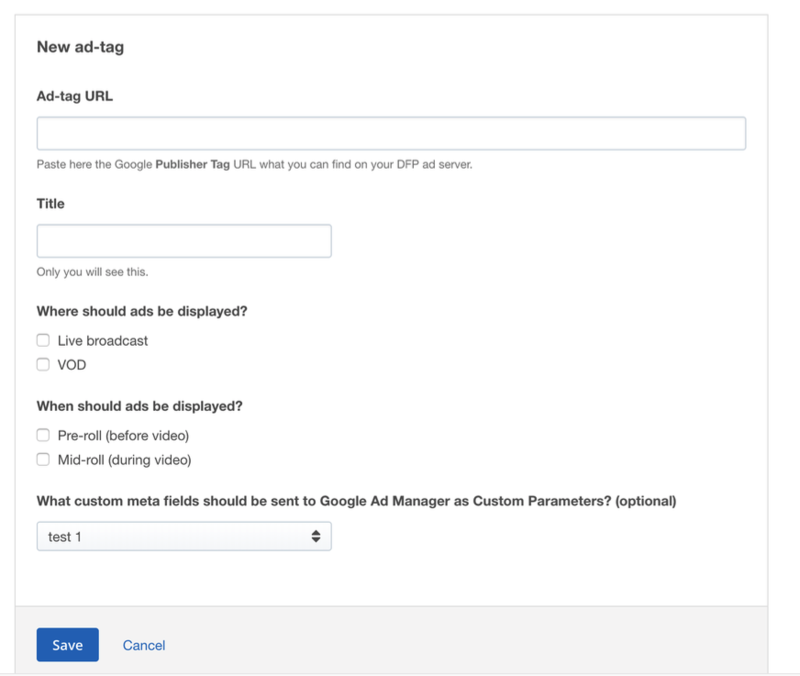 To connect Google Ad Manager to IBM WM you will need to generate and copy/paste an Publisher Tag(s) also known as 'ad tags' to your Video Streaming Dashboard. These URLs will be the link between the two systems. Once in place, you will be able to use Google Ad Manager to decide what ads to run on your IBM Watson Media content, with no need to log into your Dashboard. To get this Publisher Tag URL, you'll need to create an Ad Unit first in Google Ad Manager, which will be the identifier of the ad space you're selling spots on. If you already have an Ad Unit set up in Google Ad Manager, it is still strongly advised you read this section at least once and check your Ad Unit against the guide provided here. There are a number of global settings in Google Ad Manager which will affect all ad delivery. This part will guide you through the setup that works most optimal with IBM’s Watson Media Video Streaming. Please make sure to choose the right setup for your business goals, especially in regards of serving advertisements in Europe and countries enforcing EU privacy laws (GDPR). Please note you only have to do these settings once, as they will apply to all ads you set up subsequently. 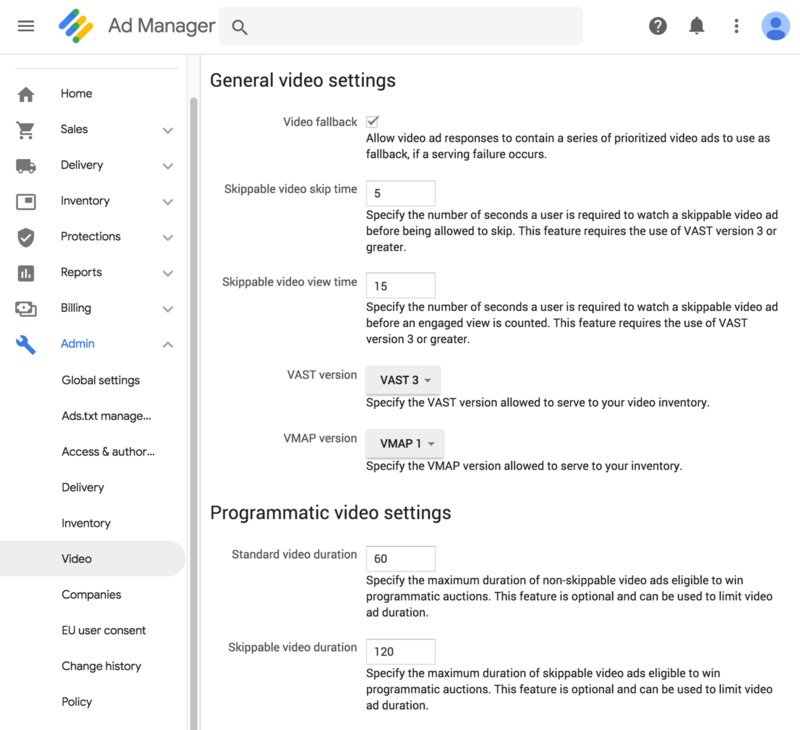 In Google Ad Manager navigate to the Admin menu item on the left – and after clicking / expanding it, choose the menu item labeled Video. 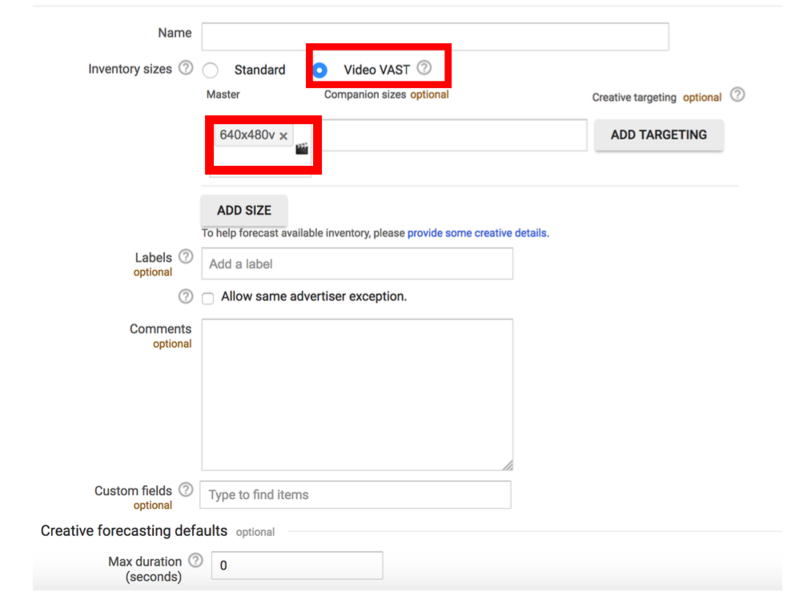 Video Fallback – Checking this box will enable Ad Manager to find an advertisement for your ad spot in multiple tries, should the first (or on occasions, first few) ads fail to deliver. This is especially useful for monetizing content with 3rd party programmatic ads, or setting up a sequence of sponsor ads during a break. It is highly recommended that you switch this option on by checking this box. Skippable Video Skip Time – This is the time in seconds a user has to wait to be able to skip a video ad. If you have set the video ad to be skippable, there will be a countdown shown in place of the skip button until this timer is up. By default the skip time is 5 seconds, which we recommend using as it’s the most common delay interval. Skippable Video View Time – This is the amount of time a view has to last before a user counts as having engaged with an ad. This setting has no relevance on ad delivery in Watson Media Video Streaming and will mostly only affect your Ad Manager reporting and possibly 3rd party ad delivery data. It’s recommended that you use the default value. 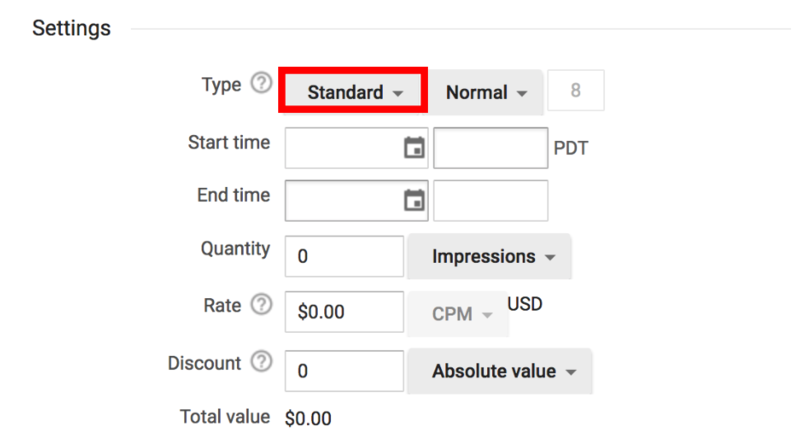 Standard Video Duration – You can set the longest non-skippable video ad length you are willing to play from 3rd party vendors (if you are monetizing your content with programmatic ads). Setting this higher will allow for more ads to play, but can hinder the user experience (users who are forced to watch long video ads they can’t skip may leave). 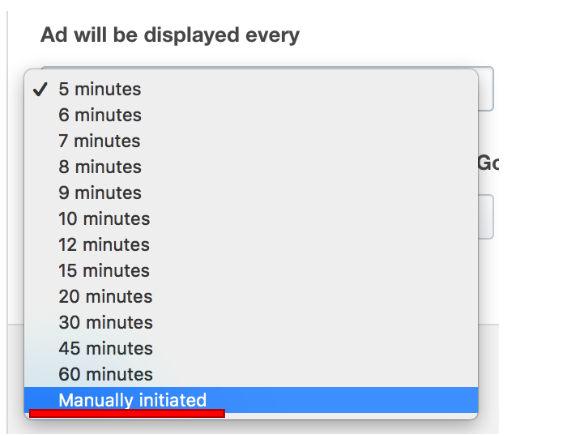 The recommended setting is between 30 to 60 seconds. Skippable Video Duration – Similarly to the previous number, this sets the longest skippable video ad duration you are willing to sell on your ad space. As a reminder, these ads are equipped with a Skip button. If you are using programmatic ad sales on your videos, it is recommended to keep this duration higher, as it allows for better monetization of your content. A typical setting would be between 120-180 seconds. 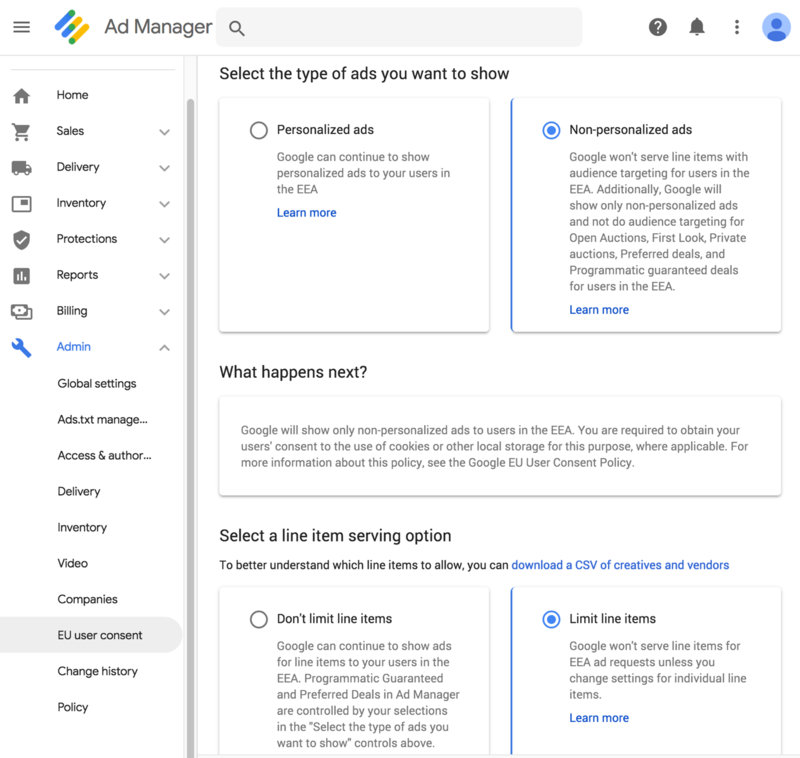 Next, in Google Ad Manager navigate to the Admin menu item on the left – and after clicking / expanding it, choose the menu item labeled EU User Consent. Non-personalized Ads – If you are serving and monetizing content in the EU / EEA it is recommended you choose this setting, as it will limit data that Google and 3rd parties will collect from your users. Ad Unit Frequency Cap – only add labeling rules if you want to apply creative-level frequency caps across specific inventories. If you don't know what this means you can skip this part. Refresh – check No refresh when using with Video Streaming. Recommended Ad Unit setup – For every type of ad spot your advertisers might want to buy exclusively into, or those you would like to have unique performance reports on, create a separate Ad Unit (and Placement, see 1.2.) This will allow you to have an advertiser's ads be running only on their choice of Placement type without the need to modify your setup. A recommended setup is using 4 Ad Units with 4 unique Placements each, Live Pre-roll, VOD Pre-roll, Live Mid-roll, VOD Mid-roll'. Alternatively, you can go with only one Ad Unit and one Placement if you do not need separate targeting or performance reports. Note - you will be able to target to specific content using the same Ad Units, you don't need a unique Ad Unit/Placement for every channel. Placements organize Ad Units into ad-targeting labels. For the purpose of integrating to the Video Streaming Dashboard, it's recommended to create at least one Placement unique to each Ad Unit. Afterwards you can create Placements that combine Ad Units to make ad targeting easier, e.g. if you have separate Ad Units for Live and VOD, also for Pre-rolls and Mid-rolls, you can add Placements that group these together, such as 'Mid-rolls', 'LIVE' or 'All IBM WM Placements'. 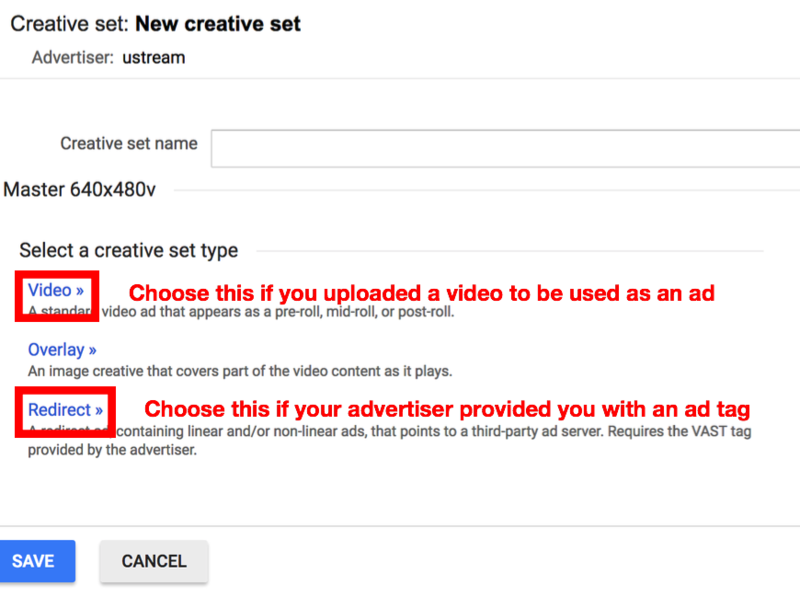 In order to create a Placement to be used with your Ad Units follow these steps. Description – Notes for yourself, which will be visible during setting up ad campaigns, and choosing where they should run. This is an Important step if you would like to target ads to specific channels on your IBM Watson Media account. With this you will be able to use the same Ad Unit and Ad Placement across multiple IBM Watson Media channels, and optionally specify which Channel ID certain ads should or shouldn't run on. This will work in combination with the Ad Units/Placements you created earlier, saving a lot of time and administration when managing ads. Display Name – This will be shown when using for targeting. It's recommended to name it IBM WM Channel ID or similar. Publisher tags are the URLs you'll need to copy and paste from Google Ad Manager into the IBM Watson Media Video Streaming Dashboard. 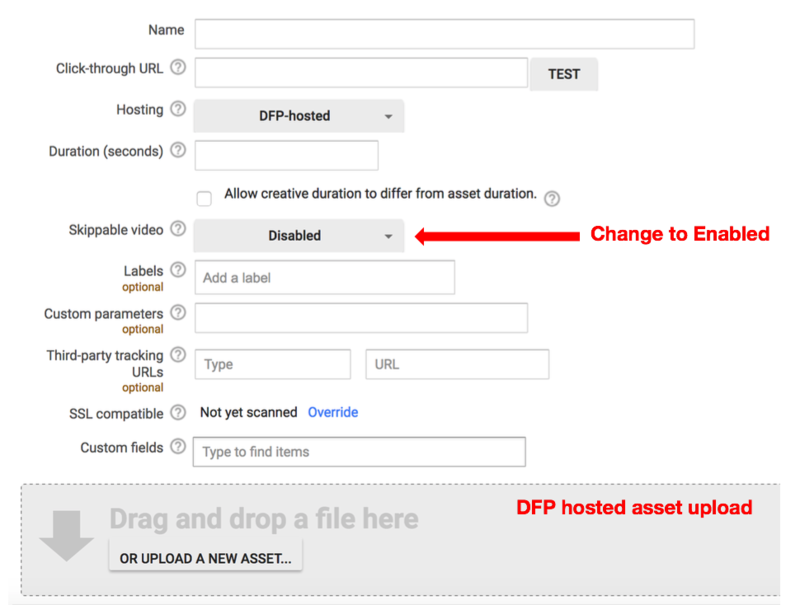 This is the step that allows the connection between your video player and your ad inventory in Ad Manager. Page Level Targeting – Please omit when generating tags, only parameters added through Video Streaming will be used. You can define these on the IBM WM VS Dashboard for each channel, using Custom META tags. Companion sizes – Omit when using with Video Streaming account, companion banners are currently not supported. Limit to non-personalized ads – if you don't supply information default will be 'No'. If you are delivering ads to viewers into the EEA (where GDPR applies) it is recommended to use a tag that by default uses non-personalized ads. 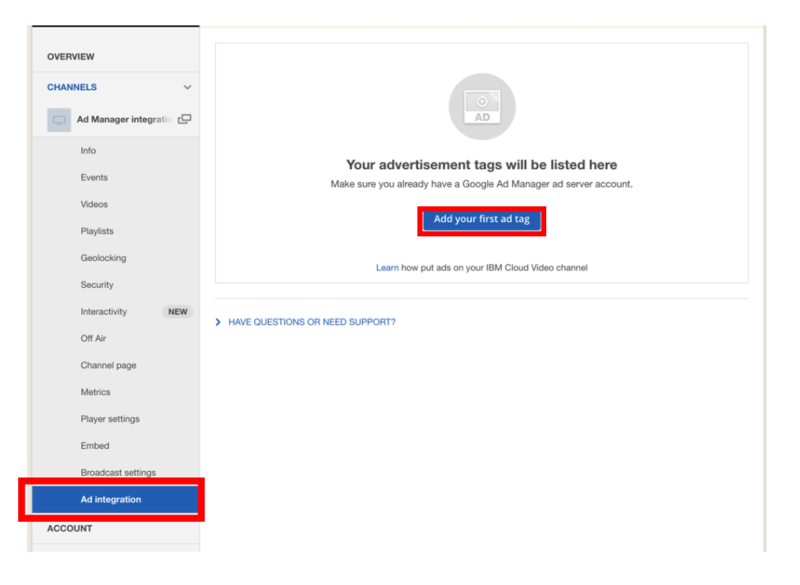 Note – your tag will connect IBM Video Streaming to Google Ad Manager, but in order for the video player to actually start displaying ads, you will need to set up ads to run. See additional help on this from chapter 1.5. In case you do not have an Ad Order set up yet, you will need to create one. Name – This will be the display name for the Order in Ad Manager. Advertiser – This field is mostly for reporting and administrative purposes. Choose the correct advertiser from the list, or create a new label as needed. Trafficker – An administrative / user access setting, it will be your Ad Manager user by default, you do not need to edit it unless you have a multi-layered Ad Operations team. Labels – Optional, for administrative and reporting purposes you can tag your Orders with labels. Name – The Display name in Ad Manager for the Ad. 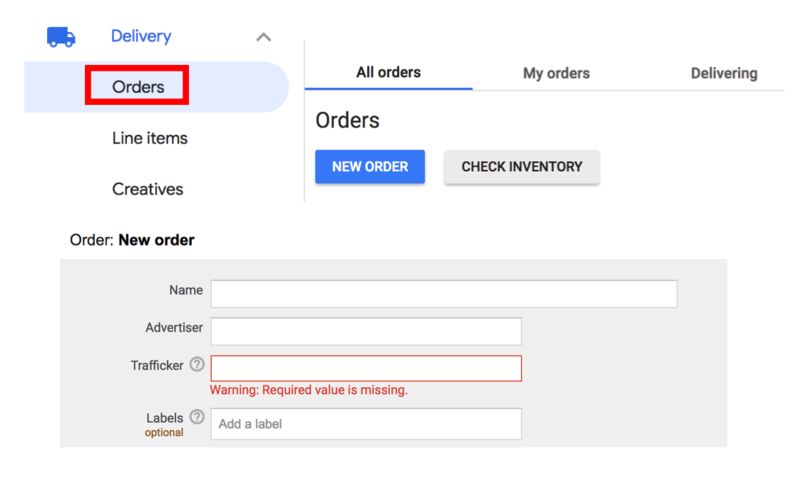 Standard – You can set the relative priority of ads running on the same inventory manually by entering a number (16 – the lowest, 1 – the highest priority). It is a very straightforward option you can use with any kind of ad you wish to run. House – lowest priority, ads will fill in the free ad spaces. Start time – The ad will only begin running on your videos once the start time and date is met. You can also set it to 'immediate'. You can time campaign launch dates with this feature. End time – Ads will stop being sent to the video player once the Line Item has reached its set 'end time'. Depending on the type of ad you chose, you may be required to set an End time. Limit: The amount of impressions for a set period. Quantity: The number of total impressions the Ad can run. Goal: the percentage the Ad should get of the total (or in case of house ads, remaining) available ad space. Adjust Delivery – Optional choices advertisers may request you to set for their campaigns, which can alter the running frequency and pace of their ads. Frontloaded – Campaign will deliver more ads in the first half of its run time, and less in the second. As fast as possible – delivers the ad whenever it matches criteria. Display Companion – Watson Media Video Streaming currently does not support companion banners. Please set this to Optional. Rotate Creative Sets – It is recommended to use the choice Optimized. Frequency – You can set how many times the Ad can show for a viewer in set minutes/hours/days/weeks/months or during the whole campaign. Limit EEA serving - If you have the necessary user consent for meeting your duties under Google’s EU User Consent Policy – Choose Don’t Limit serving. This option can be used with Watson Media. Add Targeting – you can (and most of the time should) limit ad delivery based on circumstances on the viewer's end. These include options to check what content the viewers are watching, where they are watching from, what device they use to view the videos, and so on. 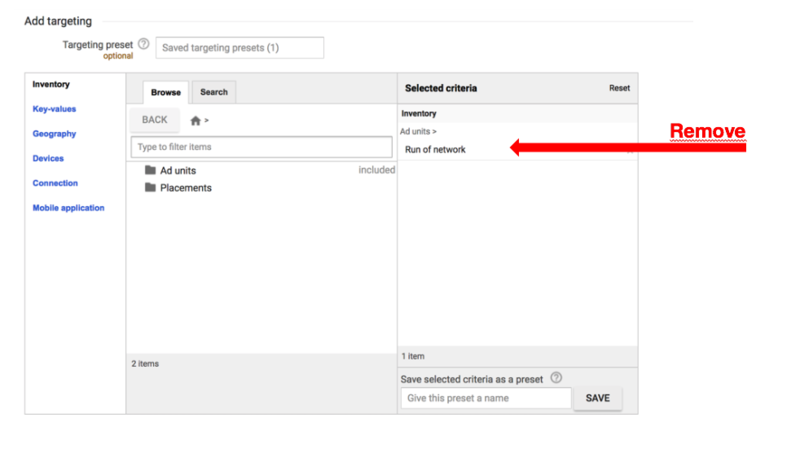 By default, ads are set 'Run of Network' – meaning they will be displayed on every video you manage through Ad manager – This setting should be removed when using a more limited / custom targeting. 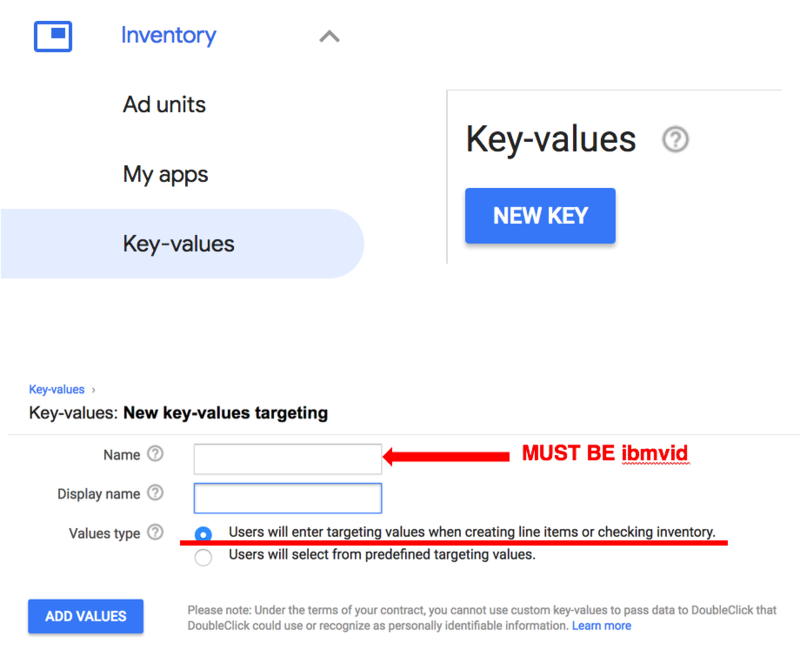 Key value –(OPTIONAL) If you want to limit the ad to only run on a specific stream, add the key 'ibmvid' (if you do not have it as an option, see 1.3) If you do not add ibmvid the ads will run on every channel you use the same Tag for. Once added, make sure to also set the value as the Channel ID*. *(The Channel ID is the unique identification number of your content. You can find it in two ways, one is to log on the Watson Media Video Streaming Dashboard, choose the channel in question, the URL will display the ID e.g. www.ustream.tv/dashboard/manage-show/00000000the ID in this example is 00000000. The other method is to click the Share icon in the Player and copy the Channel ID from its source URL e.g. www.ustream.tv/embed/00000000) Once set, the Line Item will not run on any other channel except those you allowed it for. You can specify multiple IDs as well, or use this key to exclude channels from targeting instead. Geography – Include/Exclude the list of locations where the Ad should/shouldn’t run. Devices – Include/Exclude the list of browsers/devices where the Ad should/shouldn’t run. In case you are creating a new Line Item, you are recommended to proceed to adding a Creative. Click the button 'Save and…' and choose 'Upload creatives' at the bottom of the form. Creatives are information on the actual ads (the video clips, or a 3rd party Ad Tag that has the location of these clips) which will be displayed in your IBM WM Player. Here you will let Ad Manager know where to access these clips. SSL Compatible – Only use URLs (for hosted video clips) on secure hosts (https). Ad Manager will also detect if the asset is or isn't on a secure server. Note, if your video is not secure, your viewers will see a warning or an error message! SSL compatible – Only use 3rd party ad tag URLs that are secure (https). Ad Manager will also detect if the asset is or isn't on a secure server. Note, if the ad tag is not secure, your viewers will see a warning or an error message! Note for changing settings on a Line Item later on – you will need to first Pause the line item, apply changes, save the line item, then resume. Otherwise your changes won't be saved. Important note - Not seeing any ads may be due to targeting limitations you set (e.g. Geographic location or IBM WM content ID targeting – see 1.7. ), the timing of the campaigns (start and end dates – see 1.7.) or limitations set on the Advertiser's end in case of a 3rd party Ad Tag (see 1.8.). However, if you confirmed there are no limitations to the ads you set and still don't see one, check if you are using the correct Publisher Tag. Before contacting IBM support with any problems regarding ad delivery, always make sure to test your tag and check Google Ad Manager help to resolve the issue. Some advertisers might prevent ads from being displayed on unverified domains. Such systems or companies might require you to include a verification code in an ads.txt file hosted on the domain that embeds your stream. If your stream is embedded on example.com than you will have to have a file located at example.com/ads.txt that contains this verification line. 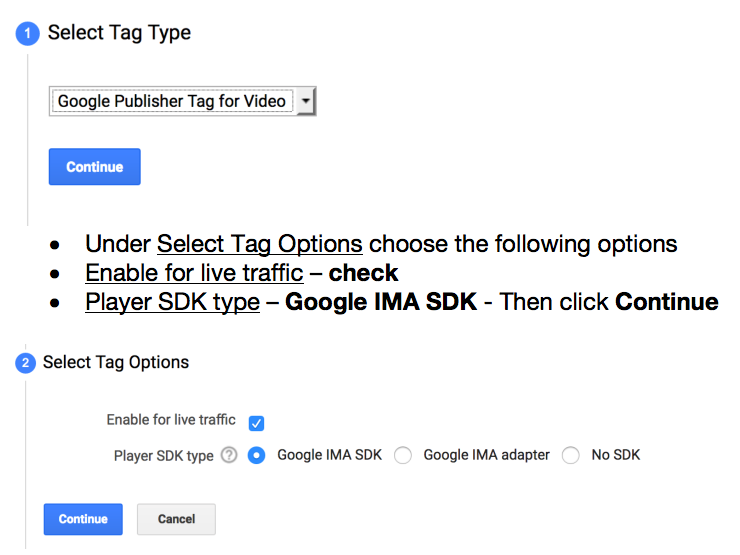 Consult this guide on how to add a Google Publisher Tag from Google Ad Manager (formerly DFP) to your Video Streaming content. This enables you to set up and control video ads in the Watson Video Player both for Live streams and VOD. See chapter I. on how to create a Google Publisher Tag and set up ad inventory in Google Ad Manager. It is also recommended you do this if you already have experience with Ad manager and have a Publisher Tag ready, some of the features of the integration will not be available otherwise. Title – Display name of the ad setup, visible on your Video Streaming Dashboard only. It's recommended to use a descriptive title. Where should the ads be displayed? When should the ads be displayed? Choose 'Manual' to trigger ad breaks on Live streams manually, at the click of a button. You can learn more about this feature in 2.4. 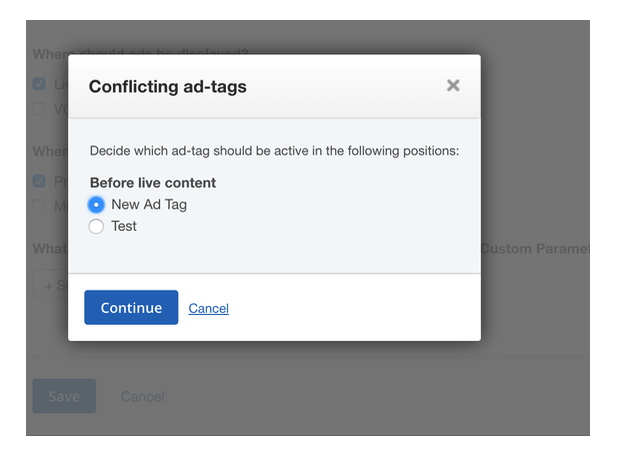 Note - in case you are about to record an Ad Tag for content you already have ad integration for, you will be prompted to select which Ad Tag to use there. For multiple conflicting points you will be presented with multiple options. Note – New Ad Tag setups you save may take up to 10 minutes to propagate. This completes the Ad Integration of your channels. You can delete-, add new-, and edit certain aspects of an already set Ad Tags. Click Pause to disable the Ad Tag. While paused, no ads will be run on the content the Ad was set up for. You can resume the ads any time. Note, changes may up to 10 minutes to propagate. Click Resume to re-enable the Ad Tag. Note, changes may up to 10 minutes to propagate. Click 'Edit' on the right to change certain aspects of your Ad setup. Please note you can only edit one Ad Tag at a time. 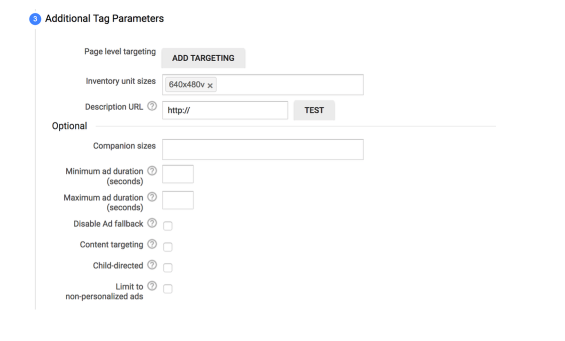 Timed intervals – Ads will be requested from Ad Manager at a set frequency (e.g. every 5 minutes). Timer starts from when the Watson Media Player is loaded, thus is unique to each viewer. Available for both Live and VOD. Manually initiated (Live only) – For Live streams choosing Manual intervals will enable a custom tool to launch an ad break on your side. The tool will become available once the 'Manual' Mid-roll Ad Tag has been saved. After a successful ad setup the tool should appear saying ‘On-demand Mid-roll tool’ at the top of the Info page. Clicking this link will pop up a separate browser window with the Mid-roll tool. Number of ads – A roll-down showing numbers 1 through 6. The number sets how many ads will be requested from Ad Manager in a sequence. Setting the number to 2 will mean two ads being requested one after the other. The same ad tag will be used for all requests made. See 2.4.2. for information how to set up breaks with specific order of commercials and non-repeating ads. Click Play ads to launch the commercial Note, you can't cancel an ad break, nor can you issue another break while one runs. The same ad tag will be used for all requests made during an ad-break. 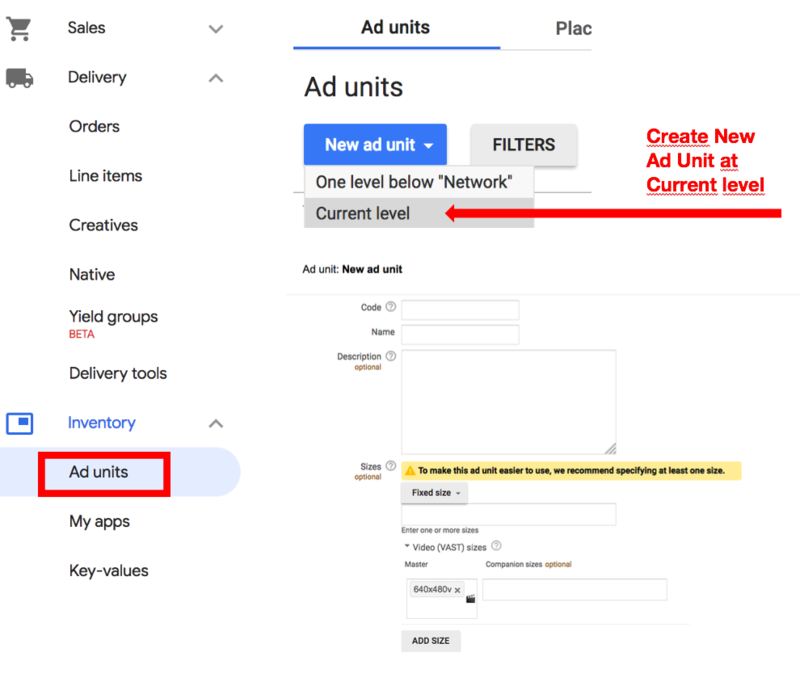 In case you prefer to run different ads in each slot during a break, or ads in a specific sequence, please make sure to set up the ad priorities and frequency caps in Google Ad Manager in accordance (see below). There is a slight delay of about 1 to 3s from initiating the commercial break on the Broadcaster side and the actual display of advertisements in the WM Player. For those viewers who were not targeted with an advertisement during the break the Live stream will remain visible, the content is not blacked out. The ad plays over the stream and it does not pause the video feed. For those viewers who did receive an ad, the content during the ad break is covered out and is not visible. Using the tool thus is ideal during natural breaks in the content that viewers can miss. Neither side can cancel the ads once triggered, and ads can't be called onto already playing ads. Once launched, the ads will play in full. 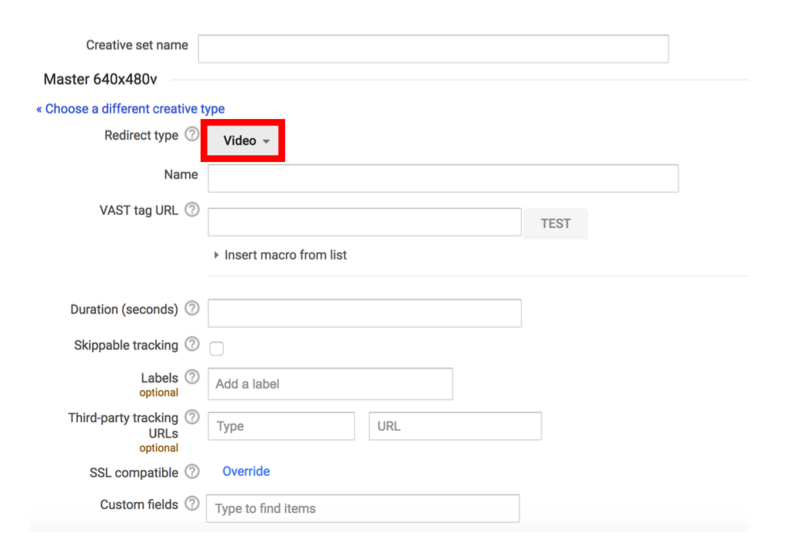 You can set up IBM WM Video Streaming to send additional information on your content to Google Ad Manager via Custom Parameters. Each ad request will send this data if you choose Custom Metadata fields when saving the Publisher Tag on the IBM WM Video Streaming Dashboard. The Custom Metadata fields (IBM) will be sent to Ad Manager as Custom Parameters (Google). or create these Keys in Ad Manager with the same name as you used to name Custom Metadata fields in Video Streaming. If the two names are identical, their values will be sent successfully. 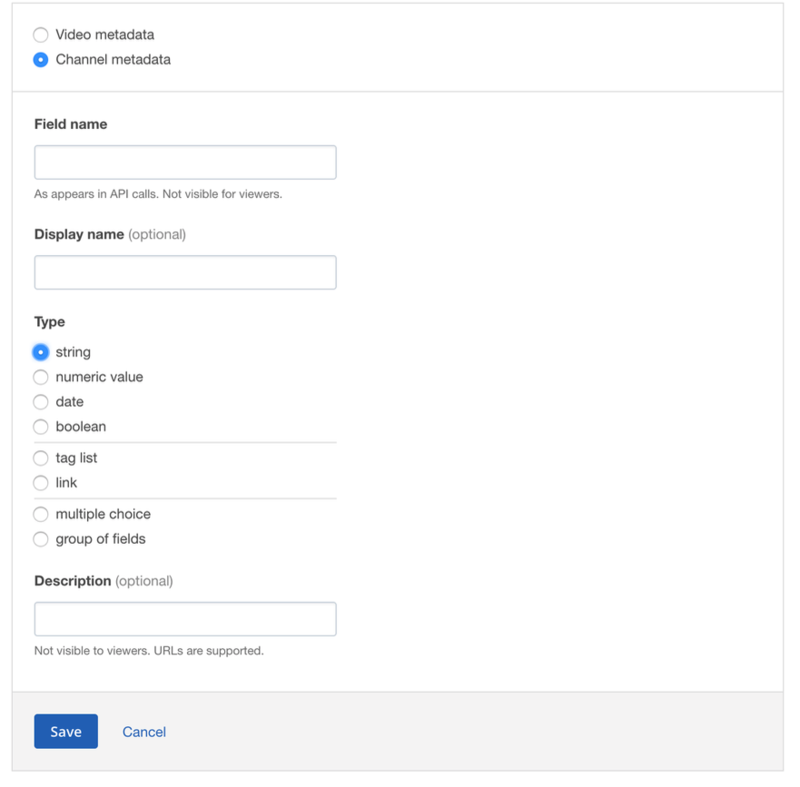 You can create Custom Metadata Fields – and set their values per channel or VODs – on your Video Streaming Dashboard. To Add a new Custom Metadata field, click Add custom field. 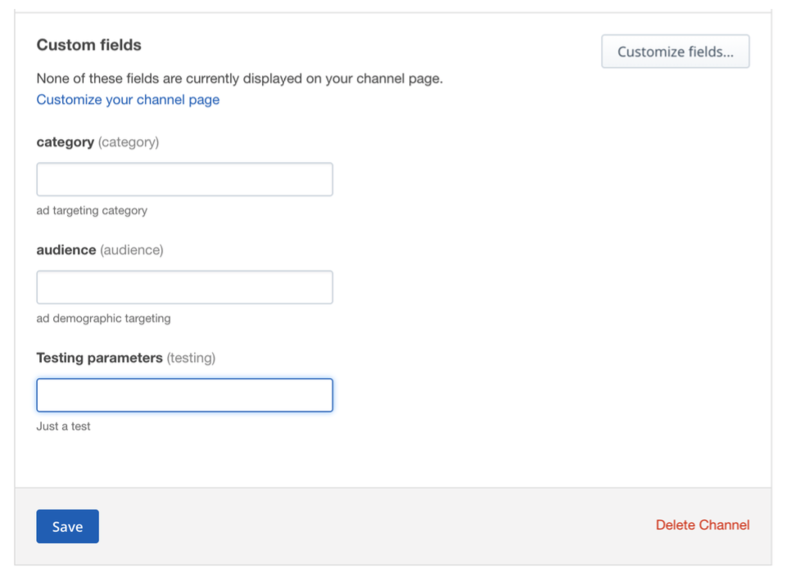 The fields you set will be the same for all channels in your Watson Media account, but you can set their values for each channel individually. Field Name – this is the actual name of the parameter, which you should match to the Key name in Google Ad Manager. It should be the exact same string. Display Name – (optional) – You can also use a second name to make the field more easily identifiable. This will be visible only in IBM WM VS. Type – you can set the type of value you want the field to have. 'string' is recommended for most cases such as passing content category names or keywords / tags / labels. Description – (optional) – Additional display-only explanation on what the field stands for, visible only in IBM WM VS.
On the right scroll down to 'Custom fields' and provide the values you want the channel to communicate to Google Ad manager. The information will be sent to Ad Manager with each ad request in the custom parameters section of the tag (cust_params=) in the format of key value pairs, where the key names are the custom fields (the field name, the grey string above the text fields) and their values as the value set for each channel on the Dashboard.